Philippines consist of approx. 7000 islands with Luzon, Visayas and Mindanao as its three largest islands. 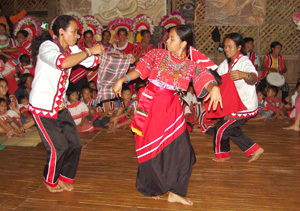 As the second largest island, Mindanao is inhibited by 16 million people. Filipinos regard Mindanao as a perilous yet hopeful land, a prosperous but destitute land, rapid development but with expanding poverty. Previously ruled by Spain, the colonial policies took away the land rights of indigenous people. Muslims were accordingly alienated and the Catholics took control of the power and many Muslims unable to accept colonial rules and segregated by the Catholics, settled in Mindanao (Moros). Mindanao possess 14 of the 20 impoverished provinces in the Philippines. The GNP per capita in Mindanao is less than $1000 and has the lowest life expectancy and highest illiteracy rate. Against apartheid policies of the government, the Islam groups are waging battles for independence, also aggravating the inter-religious conflicts. Such confrontations led theindigenous and the Muslims to remote areas. As compared to 1990 when 75% of the population was Muslim, the number has dwindled down to 25% and most of the land is owned by transnational corporations raising pineapples, banana and rubbers, or new settlers. Our involvement in Philippines began when Ven. Pomnyun, the founder of JTS, being granted the ‘2002 Ramon Magsaysay Award for International Peace and Understanding,’ was requested by the Bishop Tony who was the local archbishop at the time to assist the plight of Mindanao. With diverse ethnicity and religions, the interracial and inter-religious conflicts are strife and the Muslim/Indigenous minority in Mindanao were left out of government assistance, further igniting the confrontations. Bishop Tony suggest to Ven. Pomnyun to give a hand to solve the Mindanao conflict issue similar to his work to resolve the conflict in North-South Korea. This led to several surveys in Mindanao island in the indigenous villages and Muslim regions, also Special School for the disabled which was operating through financial difficulties, to start our education program. Since 2003, schools were built in twenty villages and agricultural/cultural assistance and assistance for preservation of indigenous culture was provided. A special-purpose school for the disabled and dormitory was also built with the partnership of municipal authority. Like other construction projects of JTS, the schools are built in partnership with the community and the local ministry of education, who provide teachers and textbook materials for the school. We also provide assistance to preserve the disappearing traditional culture, in order to ensure the succession of traditional performances through helping to provide traditional costumes and instruments. In addition, sewing machines and metal shop are provided for manufacturing of these items. In order to improve the living conditions of the indigenous populations, agricultural supplies such as water buffalo, tools, construction of grain warehouse. 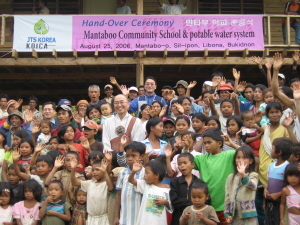 In addition, in order to raise the awareness level of the Minadanao university students, Peace camps are held with Korean university student. While they inhibit the island, many students are simply unaware of the plight of the Muslims and Indigenous groups. Through discussions, workshops and by gaining insights into the lives of the remote villagers, the younger generations are seeking a solution to the peace issue in Mindanao. Gagahuman is located farthest away from the nearby indigenous villages. Datu, the villager leader and the villagers were rebels against the government, who have settled in this remote location to escape the pursuit of the government troops. 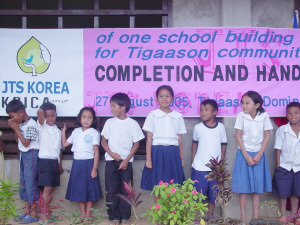 After assesment survey in 2003, a decision was made to build a school here along with several other districts in Mindanao. In order to transport construction materials, many mountain ridges and valleys had to be crossed – in the morning the villagers descended from the village to where the road ends and it was already afternoon upon returning to the village. We expected the construction to take longer than other areas. However, Gagahuman finished its construction ahead of other districts and Datu apologized for overshooting the construction estimate by a little. All this, we found out when we visited the school for the opening ceremony in January 2004.